Winter, this year, took it a bit too seriously and some of us, soon realized that the typical jackets were not going to properly handle this season. Going shopping or spending hours online searching to find the best jacket, might not be everyone’s cup of tea. Some people don’t have the time and others dislike the whole process of shopping. But, there is a type of jacket out there that you can’t go wrong with. Parka jackets. They were firstly used by the Inuit to withstand freezing temperatures and also protect them from snow and water. Typically, parkas come with a filling of feathers and a hood, which traditionally is lined with a layer of natural fur to protect the face and keep it warm. 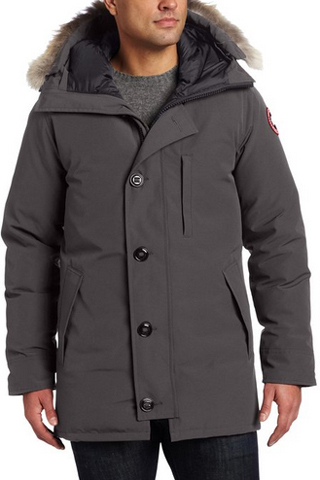 Canada Goose, the Canadian brand founded in 1957 in Toronto, has an entire collection of parka jackets, to suit every need and preference. There are light ones and a tad heavier jackets, a large array of designs and depending on what you might prefer, some do not come with fur lining on the hood. Today in this article we’ve selected several, for both men and women, so it will be a bit easier to choose the right one for you and also give you a general idea on what a parka should be like, in order to provide warmth and also be of a high quality. 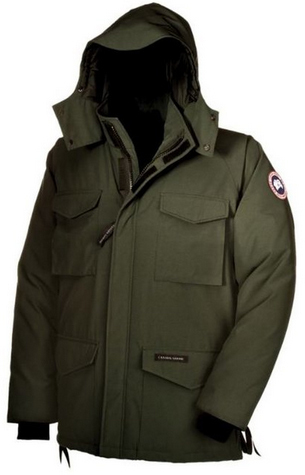 The first parka is made of 85% Polyester and 15% Cotton combined with nylon as the inner lining. The filling is made of down goose feathers, which make this jacket warm, but not too heavy. There is an oversized hood with fur lining, so the face won’t feel the icy winds. There are two side pockets and it comes with a combination of buttons and a zipper on the front. There are three colors to choose from: Graphite, Olive and Blue. 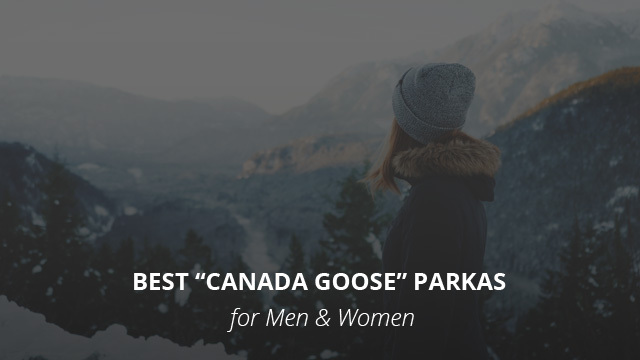 You might also like: Canada Goose Chilliwack VS The North Face Gotham: Which One Is Better? The Constable jacket for men comes as a design created in cooperation with Police officers. It is made to be practical when it comes to easily accessing your items, look professional, while all the while making sure that you remain secure from ice and low temperatures. It comes with a detachable hood, no fur lining, and a Velcro and zipper combination to make it easier for opening and closing the jacket. There are four pockets, two on the chest and two on the sides, each a decent size. It is weatherproof, provided by the material of the jacket as well as additional features such as drawstrings on the side, to prevent damage from drafts. There is only one color for this jacket, Military green. This next jacket is called Expedition, which, judging only by the name, gives a good amount of hints as to what it is made of. Water repellent material to begin with, combined with 195gsm Arctic-Tech and an 85% Polyester and 15% Cotton blend. The lining is made of Nylon plain weave, with a water repellent finish. The insulation is provided by duck down feathers, making this jacket able to withstand extreme weather conditions. 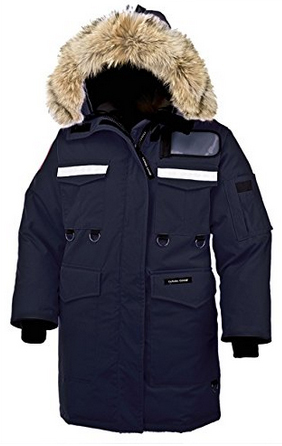 It comes with a large hood lined with fur and snaps to close it on the front. There’s a zipper and Velcro to close the jacket on the front, as well as four pockets. There are pockets also on the inside of the jacket as well as drawstrings to fully isolate the body from the wind. There are six colors from which you can choose: Navy, Blue, Black, Orange, White, Red. 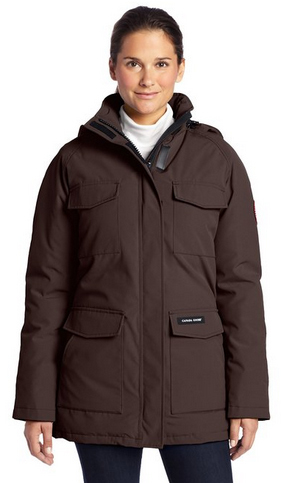 The Montebello parka for women is a very interesting design. 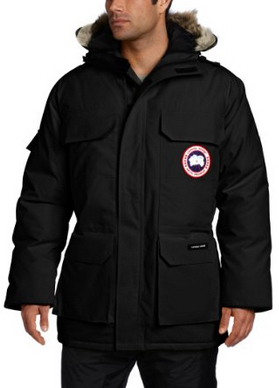 It is made of 85% Polyester and 15% Cotton with a nylon lining and water repellent material. The filling is white duck down feathers. There is a large hood, which also closes on the front with drawstrings. Buttons and zipper on the front as well as two side pockets. It also has a fur lining on the hood, which is removable. There are four colors to choose from: Marine, Grey, Black and Navy. 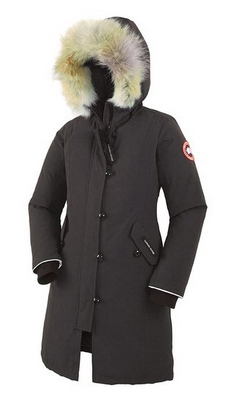 Read also: Why is Canada Goose so Expensive? Are their Jackets Worth the Price? There is a Constable jacket for women as well. Designed to be as practical and warm as the one for men, this jacket comes in Brown – Caribou color, with a removable hood, four pockets on the front and a Velcro and zipper combination as closure. 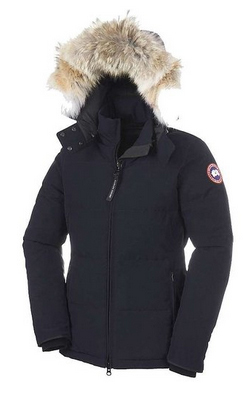 Read also: Canada Goose Fake vs Real Jacket: How To Spot It? The Brittania parka jacket for women, is designed to allow for mobility and comfort. It is made of 85% Polyester and 15% Cotton, with white duck down feathers as a filling. There is fur on the hood, which is removable. The zipper is a two-way one, concealed with a press stud strip. The pockets on the front close with snaps and they are lined with fleece, which works as a hand warmer. There is also a security pocket on the inside and an elastic mesh pocket as well. The sleeves have knitted cuffs at the end, for additional insulation and warmth. It is wind and water resistant. The Chelsea parka is a hip-length jacket with a simple design. It closes with a two – way zipper and there is a detachable hood with an oversized fur lining, also detachable. It is made of 85% Polyester and 15% Cotton with white duck down feathers as a filling, to insulate the jacket from the cold. It is waterproof and windproof, albeit being a very light jacket. The sleeves have knitted cuffs to make sure that you are warm even while your hands are not inside the pockets on the sides of the jacket. There are two colors to choose from: Marine and Black. You might also like: Canada Goose vs Arc’teryx – Which Brand is Better? The last jacket on the list is called Resolute and it is the bulkiest of the bunch. This jacket for women comes in two colors: Navy blue and Red. It contains an oversized fur trim on the hood, with Velcro and snap closures. It closes on the front with a zipper and Velcro as well. There are four pockets on the jacket, each containing rings at the bottom that can be attached to rope, for safety while climbing or traveling on slippery ice. There are also reflecting strips on the upper pockets. There are knitted cuffs at the end of the sleeves and also an ID tag pocket on the upper left side. This jacket is ideal for those who intend to go on expeditions or even as a parka that can be used during weather emergencies. Previous Article← Eddie Bauer vs Patagonia: Which Brand is Better?